Excerpt from "The History of Ottawa County, Ohio and its Families" (c) 1985 The Ottawa County Genealogical Society. Etien Brule, a Frenchman who had come to the New World with the Champlain expedition, was the first white man to visit our area. On Nov. 1, 1615, he put ashore at the mouth of a slow moving stream which he named "Toussaint" that is, All Saints, in honor of its day of discovery. The white man did not come to stay, however, until about 1814, when French-Canadians settled along the Toussaint, to hunt, fish, trap and trade with the Indians. The township was formed in 1835 from Portage Twp., Sandusky County. When Ottawa County was formed its boundaries remained unchanged. If, as claimed, there ever was a gentleman named "Carroll", he does not appear on the 1820, 1830, or 1840 census. From 1835-1837 a band of thieves lived along the south bank of the Toussaint. They plundered as far away as Toledo, Fremont, and Sandusky. Vigilante settlers turned out 'en masse' with guns and drove the thieves away. Settlers from the east started coming in the 1830's, By 1840, Anglo-Saxon surnames appeared on the census along with the French. Names included Acker, Applegate, Beaudan, Berry, Cataract, Cature, Columb, Coover, Coturo, Cowell, Crow, Davenport, Delong, Dishay, Eddy, Favereau (indexed as Faverson), Leradee, Linsley, McGowan, McNutt, Meeker, Minier, Moore, Navarre, Ogden, Perry, Pickard, Pierson, Richards, Sautrart, Stewart, Stull, Vellicat, Widener, Wormworn, Yeap. Population was 259: 156 of these were age 20 and under. In 1850 there were 211 males, 192 females, 76 dwellings. One householder, listed his birthplace as Germany. By 1880 the population had grown to 1901: most of the increase came from German immigrants. As the state became more urbanized the miles of beach drew many vacationers, and in the 20's and 30's many Toledo and built second homes at Locust Point, Long Beach, and Sand Beach. Still more were built in the post war years. Lake Erie's rampage in November 1972, put an end to expansion; many houses were destroyed in that and ensuing storms. The remaining homeowners have "dug in" with pilings and breakwaters and hope Lake Erie will let them stay. St. Joseph's Roman Catholic Church in Frenchtown was at first a mission served from adjoining parishes. Mass was celebrated in the homes of the communicants until 1845 when a log chapel, the first church building in the township, was built. A frame church was erected on sct. 7, Duff Washa Road in 1861, and services were held there until 1942, when it was made a part of the Bono parish. The building was razed in 1944. The first Protestant church seems to have been the Rusha United Brethren Church. 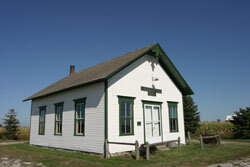 It began as a "class" meeting in the township schoolhouse. Later their church was on Toussaint South Road across from Rusha cemetery. In 1876 a German Evangelical congregation was chartered. Their building was already on the Windisch property, sct. 14, Toussaint East Road. In ;later years the building was moved to Toussaint South Road, and the congregation either merged with the Rusha United Brethren or shared the building. This building was struck by lightning and burned in August, 1915; the members transferred to other congregations. Locust Point UB Church was formed about 1871; a frame church was built on Duff Washa Road. In 1961 the congregation joined with La Carne EUB to become LaPointe EUB. About 1866 the Adventists began holding meetings. A frame church was built on the NW corner of Duff Washa And S.R. 2; it was later moved to sct. 3, Duff Washa Rd. Services were held there until the 1960's when the congregation became part of the Seventh-Day Adventists Church, Fremont. The RLDS Church is the only congregation still active; it's history is covered elsewhere in this book. The township had two school districts, each with its own board and millage rate. Roseland, Leutz and Fick Rds. Frenchtown, Darsh Rd., was moved across the road and is a residence. These one- and two- room schools served the community until 1939 when the centralized Carroll School was built for the first eight grades. The district paid tuition to Salem-Oak Harbor for high school students until 1961 when the township became part of the BCS school district. Carroll students grades 1 through 5, still enjoy a "local education." * The schools, besides their names, had numbers. The numbers in the text are for clarity in reading and not necessarily correct. Mishaps occurred in earlier days too. As Inez Floro Smith's schoolmates were ringing the bell as the two-story Nina school, the clapper fell, just missing her head. In 1922, the day before classes were to start, a crew was cleaning up the Carrollton schoolyard and lit a small pile of brush. A sparrow picked up a burning twig and carried it up into the cupola. Soon the entire building was ablaze. A neighboring farmer, John Schultz, quickly brought his tractor and towed away the township steamroller, which was stored nearby. The new school was built; it is now a residence. Rural Free Delivery came late to Carroll Township. Locust Point Post Office operated from 1858 to 1903. In 1884-5 Dr. John W. Ross Sr. built a 28'x52' structure, close by present S.R. 2 on the north bank of the Toussaint. The front half of the first floor served as a post office and general store; the rear half and second floor were living quarters. When William Buhrow bought the land in 1915 the building was moved back 300 feet and brick veneered; it is still a private home. Other post offices included Frenchtown, Velliquette, Toussaint and Nina. Blacksmith shops were located on S.R. 2 south of the Toussaint, on the NE corner of S.R. 19 and Salem-Carroll Road, and on Fick Road near Leutz Rd. That blacksmith built a merry-go-round, with wooden horses, alongside his shop, where children could ride for a nickel. Charles (Molasses) Miller ran a sorghum press on his farm on the present S.R. 19. Each autumn farmers from as far away as Gibsonburg brought wagon loads of sorghum cane. The press was powered by horses pulling around in a circle. The liquid was extracted and ran into a nearby shed, where it was cooked down in vats. Children enjoyed stopping in for some of the foam which was skimmed off as it was cooking. The sorghum press was discontinued about 1920. Although some commercial fishing continues, it is no longer a mainstay; however marinas and charter boats cater to the amateur fisherman. The township has long been famed for its hunting. One of our older residents recalls her uncle carrying two burlap bags full of ducks home from the marsh. The days of the marker hunter are long past; now many acres are wildlife refuges owned by the ODNR. Most residents who are hunters are also conservationists. 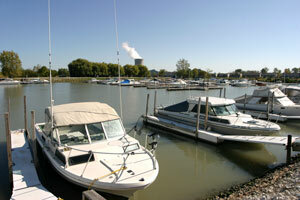 Toledo Edison's plant has brought this community a new prosperity, many of its employees live here and in nearby areas. For fun there were dance halls. Williams' and Covers' charged a nickel; the Sand Beach Pavilion was more exclusive and charged a dime. The Knights and Ladies of Security held their meetings in a hall on S.R. 2. south of the Toussaint. In later years Bark Inn was a well-known night club. The picturesque building was covered in bark. When it caught fire on a Sunday afternoon in the 50's it fulfilled predictions by "going up like a tinderbox." Although the night club is long gone, the curve on Route 2 (once dangerous, since made safer) is still known as the Bark Inn Curve. Other than the township line roads and the 5 "Toussaint's", most of the roads were names for property owners, although some were misspelled. Beiers, not Biers lived on Bier Road. There never was a "Behlman", in a 1920 county map the road is listed as "Behlmer." An iron bridge across the Toussaint on the present Route 2 was built in 1878 for $7,500. "The day for cheap, wooden bridges had passed," declares the 'Ottawa County News." How Rusha Creek received its name is not known. It is pronounced "Roo Shaw", not "Russia". "Toussaint" probably became "Too Sang" when English and Germans tried to pronounce a French name. " 'Toussaint' is the way we spell it, 'Too Sang' is the way we yell it"